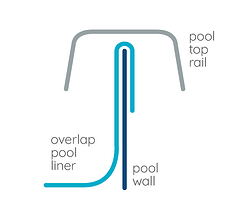 There are three types of liners used for Above Ground Pools; overlap liners, beaded liners, and UniBead Liners. Ovarlap Liners are the most economical choice in above ground liner. just as the name suggests the liner literally overlaps/drapes over the side of your pool wall and is then secured by the pool's top rails. This is the kind of liner you'll end up with with you're looking to install an above ground pool with a deep end. 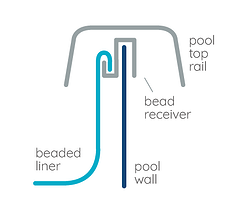 Beaded Liners snap into a bead receiver or track that runs around the top inside portion of your pool. This type of liner is easier to replace compared to overlap liners. UniBead Liners, or J-Hook/V-Bead, are easy to install, durable, and very secure. You can install UniBead liners in 2 separate ways: as a J-hook or as a Beaded Liner. 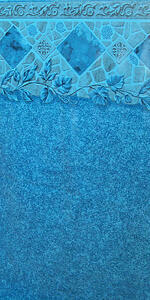 See more on UniBead Liners here. WHAT'S THE DIFFERENCE IN MIL AND GAUGE? There are both terms used to measure for a liner's thickness. Mils are regulated while guage is more of an approximation. Mil is an actual unit of measurement and gauge is more of an estimate based on findings. Mil represents Gauge one thousandth of an inch. 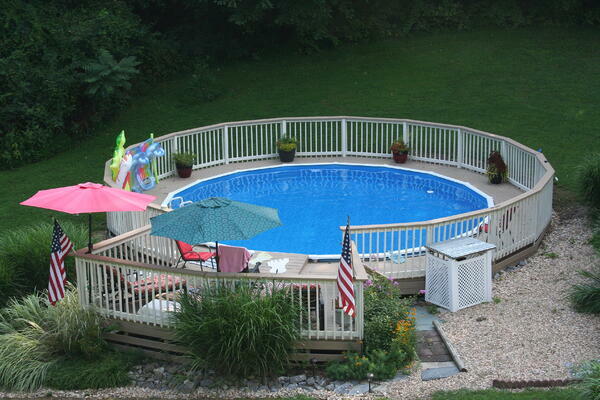 The first step to narrowing down your choices is to determine what you want the overall color of your pool to be! If you know up front that you want more of beachy looking pool, you’ll save a lot of time by passing over the dark blue liners scattered throughout the pattern line up. While the liner plays a very large role in the end result of your pool’s color, there are other factors to keep in mind when choosing your liner color as well. For example, one factor is the sky. Your pool will act like a mirror and reflect the sky and clouds. That’s why the ocean is blue rather than beige like the sand! A darker liner is more likely to absorb sunlight, and therefore can help to warm your pool water. 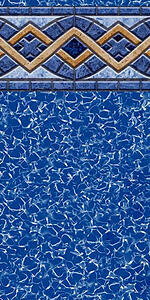 Darker liners will also make it more difficult to see debris and dirt in your pool. 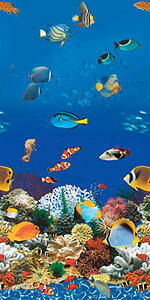 But as liners become darker, they are more inclined to fade over time due to UV damage and Chlorine. You will notice fading quicker, but it may take longer to actually bleach completely since most liners are printed on darker blue vinyl. Lighter colored liners will not be as susceptible to fading. They will attract less sunlight and will be less likely to show bleaching and fading as fast over time due to less UV damage. A lighter liner will show more debris and thus, demand to be cleaned on a more regular basis. A popular reason for choosing this style is due to there being less of a change in the way the pattern looks over longer periods of time. The good news is that no matter what color you decide to run with, there will still be a plethora of patterns available to you! You can have everything from a simple design that mimics water movement to an under-water kaleidoscope of swimming fish! Essentially, it's most important that you know the look that you're wanting to achieve when choosing your liner. This will narrow that long list of choices down exponentially. Knowing the end color you desire as well as if you are going for elegant, simple, or fun vibes will keep you focused on the designs that truly complement your style. For additional resources on liner care and above ground pools, check out some of our other articles! 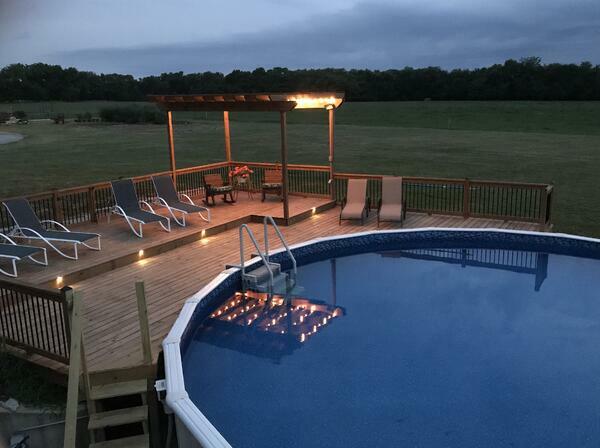 What's Better a Round or Oval Above Ground Swimming Pool?